Taos Sunrise Builders specializes in high end custom Pueblo style homes, sometimes referred to as adobe homes. We take the ancient art of Pueblo / adobe construction and turn it into modern structures. Our Pueblo style homes are completely unique to you and your vision. We will work with you through the planning, design, and construction phases of your new home. Experience the New Mexico atmosphere in the comfort of your Pueblo Style home. At Taos Sunrise Builders we take pride in our work. Our process starts with a free consultation so that we may understand your vision. We work with you every step of the way to ensure that all of your needs are met. This includes planning and design, development, interior and exterior design, financing and everything else. 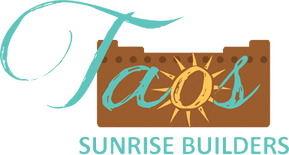 Taos Sunrise builders has built homes for the those desiring a custom home all around New Mexico, Texas, Los Angeles and New York. Taos Sunrise builders can help you to plan, design, and construct your new kitchen and bath spaces. We understand that these are important parts of your home. We offer custom work as well as Crestwood, Inc., International Kitchen Supply, Elmwood Cabinets, United Stone, Pro Source and more. We take pride in our work and want you to love your space. Contact us today for a free consultation. Taos Sunrise builders is glad to offer our remodel and addition services. If you are looking to expand a current property, repair after fire, water or elemental damage, or just upgrade… We are here to help! Taos Sunrise Builders offers residential and commercial plaster, stucco and concrete services. Please contact us for a free evaluation of your needs. Flooring is an integral part of your home or office. Taos Sunrise Builders offers tile, hardwood, laminate, concrete and other flooring services. We offer new construction as well as remodel flooring services. Please contact us today and let us know how we can help. Taos Sunrise builders offers roofing and plumbing as part of our custom home and remodeling service. If you are are only looking for roofing or plumbing service please contact us for availability and prices.